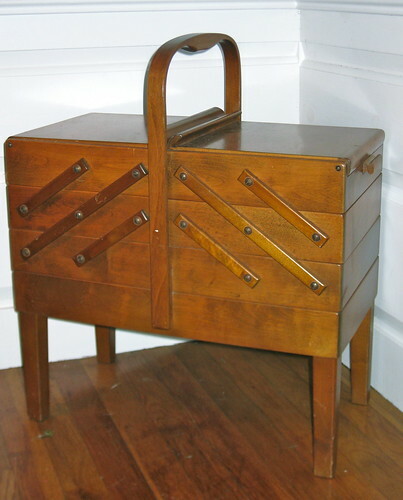 I found this vintage sewing box on craigslist last summer and it needed a few minor repairs, but I absolutely love it! The top opens and the sides unfold, exposing five additional compartments. It is portable and holds all my hand sewing supplies. If you love to sew (or have any craft that needs a home) and come across on of these, I highly suggest you grab it! Love it! I could really use one. With all those compartments you could have a little place for everything. How did I end up with two daughters who are not interested in any hand sewing? I guess, like they say, it often skips a generation. It is one of my favorite things to do. What could be more lovely than sitting in a pretty room, on a comfy chair, on a bad weather day doing hand work. Good for you. Great find!